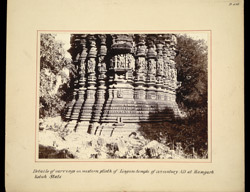 Photograph of the carvings on the western plinth of a temple at Ramgarh in Rajasthan, taken by an unknown photographer for the Archaeological Survey of India Collections: Northern Circle (North-Western Provinces and Oudh) in 1896-97. Ramgarh is a 14th century temple site situated about 60 miles north-east of Kotah. It is surrounded by a system of hills which forms a valley with a beautiful lake in the middle. On the eastern bank of this lake stands a temple dedicated to Kamesvara Natha, built by Maharaja Priyavarman. A twelve-sided lingam stands in its centre, over which a pyramidal tower rises. A domed vestibule and portico both stand in front of the edifice. The lintel over the entrance door represents Shiva surrounded by his eight saktis and the columns, ceiling and external tower are all intricately carved with well-known images of Hindu iconography. From a long inscription found in the main edifice it becomes clear that this temple was erected for the express purpose of illustrating the Kamasutra. The Kamasutra is a treatise on love that was written by Vatsyayana in the fourth or fifth century A.D.